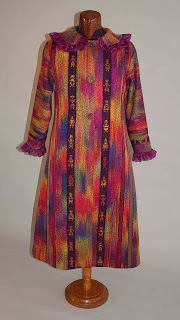 Inge is like a "best kept secret".... well, its time to spread the news about her wonderful blending of ancient card or tablet weaving with more modern looms and breathtaking fabrics. 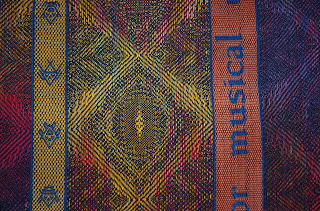 I had seen her work and even tried my own take on her unique cloth but as nice as it was, it paled in comparison to hers! Inge actually inserts card weaving with a conventional warp on the same floor loom. 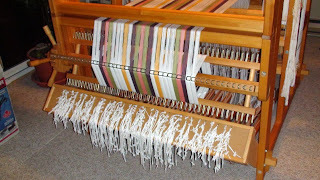 So you must be familiar with card or tablet weaving AND floor loom weaving. 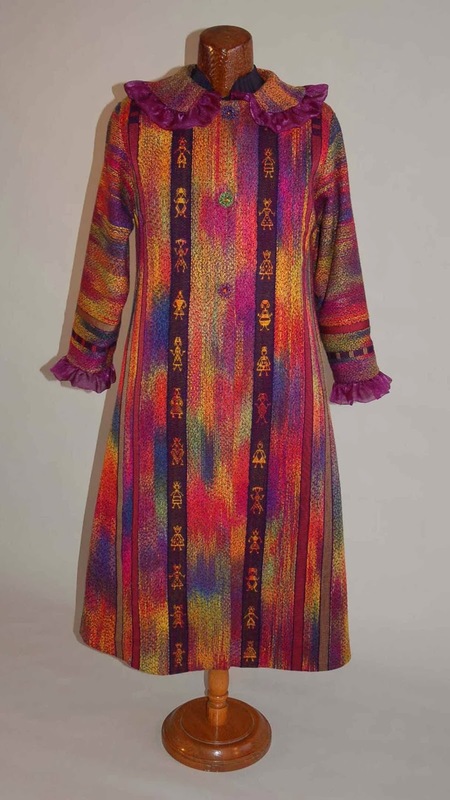 Judging by the fabric above, she is also at home with a dye pot too. 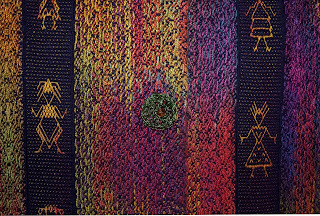 I have been weaving for 31 years and in 1992 I completed an in-depth study for Ontario Handweavers and Spinners to become a Master Weaver. 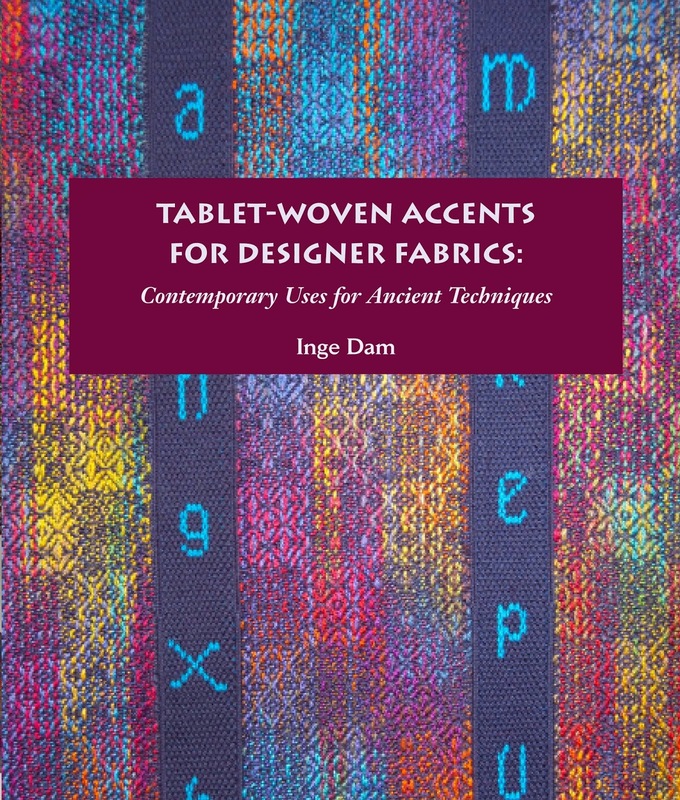 The subject of the study was Iron Age Textiles from Northern Europe (the Iron Age was from 500 BC until 800 AD). In the course of my study, I became interested in tablet (card) weaving. 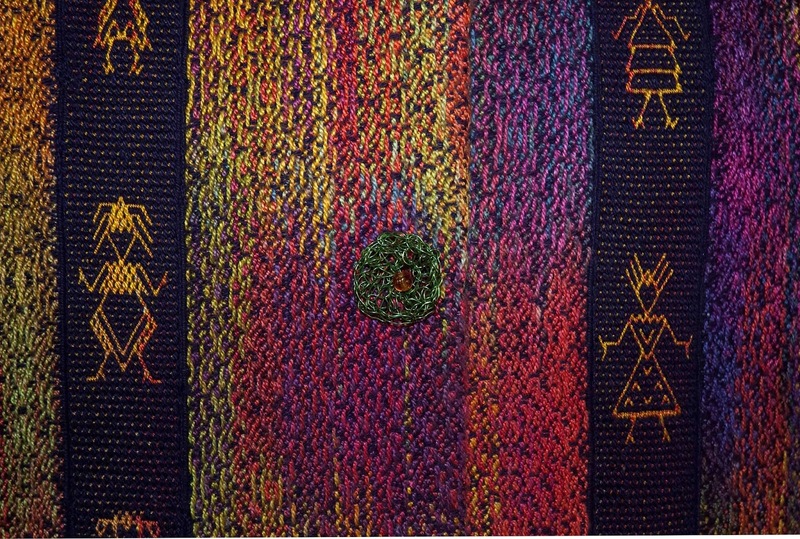 In excavation of Iron Age sites in Northern Europe (particularly in peat bogs and graves), ancient textiles have been found with tablet woven borders. 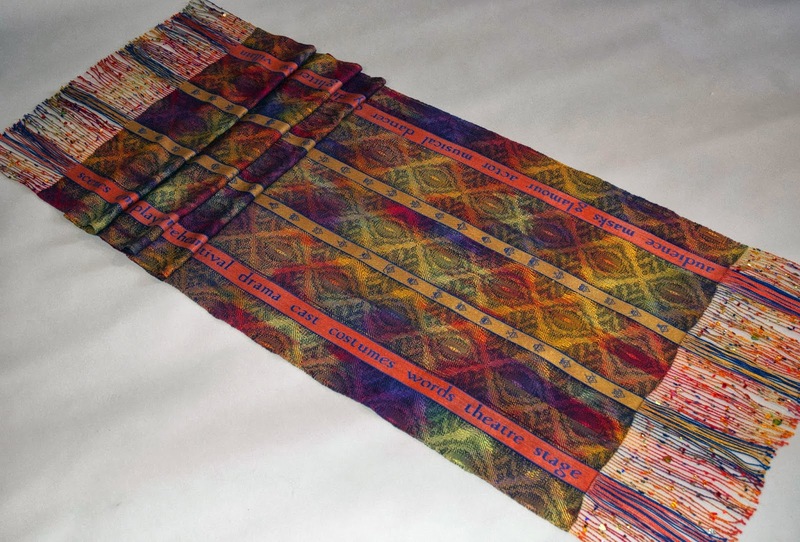 Through inspiration of these textiles, I now incorporate tablet weaving into my fabrics by weaving the tablet borders and bands simultaneously with the fabric on the loom. I also make unique jackets and bags from my leftover handwoven fabrics. And wow does she ever make unique fabrics! This method intrigues me! So when I heard that Inge had written a book on her method, I was eager to get a copy. It combines many techniques and clearly Inge has mastered them beautifully. I have been reading her book slowly and carefully as I really want to try this for myself. Its become clear my first place to start is with tablet weaving basics. To simply dig them out and start fresh. Once I have my projects complete for the coming Christmas sale, I plan to get out the cards and thread them up. 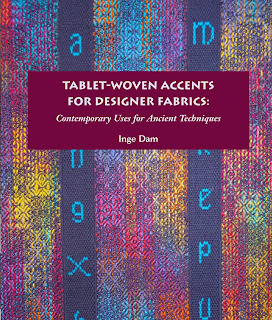 If you are looking for a unique Christmas gift for a weaver, or for yourself, you find all details on this book at Inge's web site: www.IngeDam.net A visit to her gallery is a wonderful browse! So here's my Bruce in his private hospital room and his private 'spa' bathroom in behind. He was the first occupant of a brand new $15,000.00 special gel bed that shifts to balance the pressure points every time you move. They placed him in this room as his older medical file kept coming up showing him as MRSA positive, but they finally cleared that off the file with a negative test. He got to keep the room as no one more deserving needed it. He's smiling as he's been told he can go home and we are waiting for the paperwork to be done and the IV to be disconnected. He's not been 100% since we got back from our trip and finally normal treatments for his diverticular disease just weren't working. They admitted him and gave him the "special" IV antibiotics that they save for times like this. He will be going back in sometime in January under better circumstances and having an operation to resolve this. So my days of driving to and fro have come to an end and we will now slowly get back to normal around here! (emphasis on slowly) I guess I don't need to tell you that there has been no weaving going on around here but I plan to make a fresh start again tomorrow. 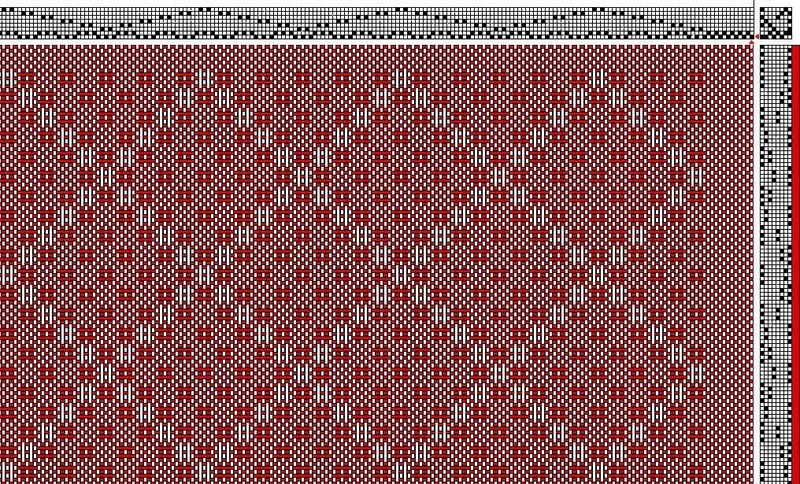 I'm weaving two shawls using the same draft and colour schemes as the previous scarf project I wove back in July and August. They were stunning and sold right away...and I'm down to only one shawl in my inventory! 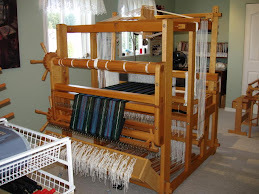 I have also made a decision to sell my big 12 shaft/ 16 treadle 45" Woolhouse Tools Gertrude Loom and so will be building up a list of its components and formulating a price. I'm not in a position for doing shipping / freight so it would have to be picked up here on Vancouver Island. I do recommend the new owner actually comes and dismantles it here with me so they have a better understanding of how it will go together at the end of its journey. More on this to come. In the mean time if you have a serious interest, email me at weever at shaw dot ca (remove the spaces and put the right symbols in. Why am I doing this? Well, I can get joint replacement surgery for my knee and last hip and even my foot in time and still carry on weaving in time, but my lower back is the way it is and there's no surgery to fix that. Weaving with this loom aggravates it. Trust me, if this wasn't the case, I'd be keeping it! I have been weaving almost exclusively on my Louet Spring and I guess its time to get friendly with the Megado and "make nice". I'm coming to terms with my limitations, and I plan to keep weaving! 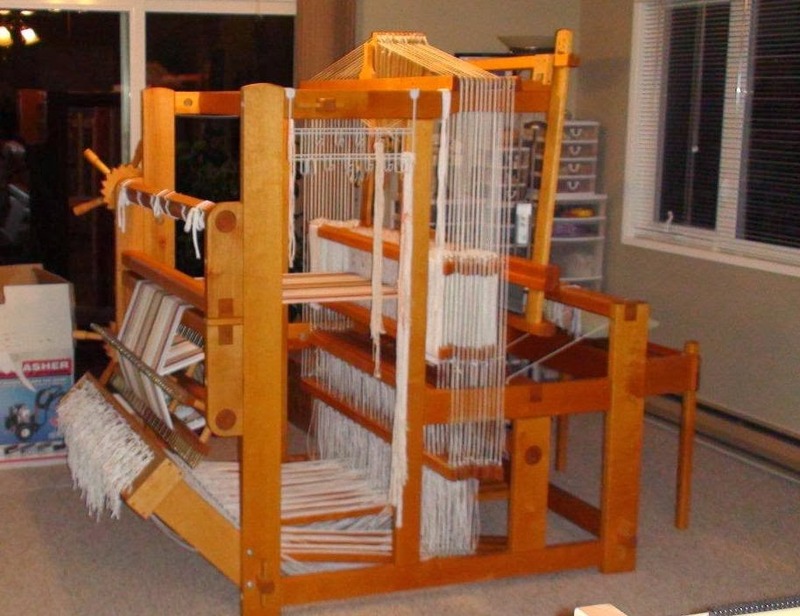 So, with the parcel with the gray runners on their way to California, the loom is now available for a new project. I had something in mind for the 9/2 red linen in my last yarn order from Brassards. Last spring when we were in Vancouver I stopped by my Dad's place and had a nice visit with him. During the time chatting with him, I spotted a small lace cloth on his table that I woven some years ago. 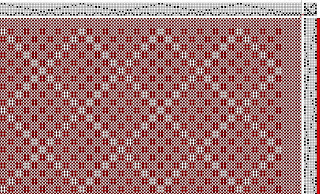 It was a fine 20/2 cotton with a huck lace diamond pattern. I had been given the pattern by Linda Heinrich and she in turn got it from Virginia West. It has to be one of the loveliest lace patterns and it went onto my mental list of projects that are up soon. So the yarn arrived and I had found my old draft.... project was duly planned and the warp wound. The 9/2 linen came in at 3700 yds/ lb which is finer than an 8/2 cotton. The cotton is 3360 yds/ lb and recommended setts are 18 epi for lace, 20 epi for plain weave and 24 epi for twills. It gave me a place to start at least. I wrapped a ruler, and I emailed Gudrun for her input as she uses this linen too. So we finally settled on 22 epi and I thought I could up or down from there if need be. When it came time to sley the reed I had to do a pattern of ends that meant I had to use a more open reed to get the desired sett. Now my past experience with linen is that its better to use either single ends through a reed or double ends. If you do groups of three or more, then reed marks can be an issue. I did not want any problems like this so I changed my reed to something finer and got smaller groups. With a 15 dent reed, I sleyed 1, 2, 1, 2 etc. It averages out to 22.5 epi which was darn close! The runner warp was 5.25 yards long, 14.9" in the reed and a total of 328 ends. Winding the warp went well. When I wound my pirns I ran the linen through a damp cloth and it seemed to tame the linen and take off a fair amount of lint. Weaving was pretty darn nice and the sett looked perfect! 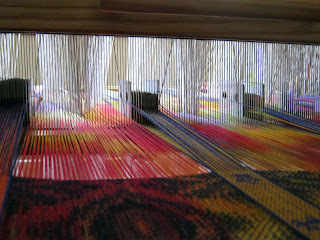 The weft lay into the pic beautifully, there was very little draw in so I didn't need a temple. Then with plain weave borders, there was no need for floating selvedges either. Very liberating! The treadling was a nice little five treadle dance (plain weave, pattern, plain weave, pattern, plain weave). You very quickly settle into a good rhythm and it wove up at a nice rate. You could also see the pattern clearly already which was very nice. I planned on two runners, both sixty inches long and with six inch hem allowances (which would reduce down to two inches after folding), and some samples. I wove one runner to sixty inches plus hems and I had my samples all done. There seemed to be a lot of warp left so I decided to simply weave a longer runner as the warp held out. The second ended at seventy four inches! Once off the loom I pressed my hems much like in my last post and pinned them. The hand sewing didn't take very long and then they were into the laundry tub for the hand wash and rolled in a towel to absorb water. The ironing was a real workout! I was pressing as hard as I could and the wrinkles were still there. I found myself lusting after a mangle or steam press like Lynnette's. I just kept going back and over them again until they passed muster. Time to take some pictures, which can be tough this time of year. We had cloudy skies and trees all around. 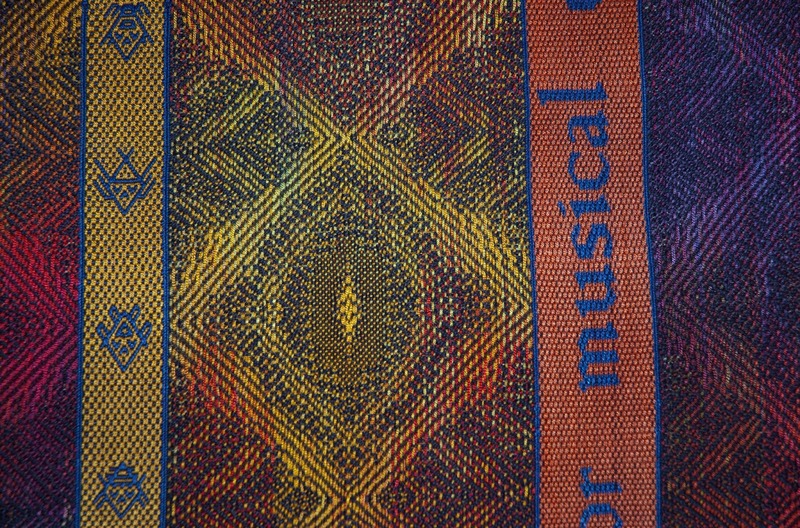 the brightest place was my big loom and so I laid a cloth over the loom and tried for some beauty shots. Photographing all red is almost as bad as all white ! First of all the real colour of the runners is a blue based red and the pictures I see are a bit more orangey. Then its hard to see detail with tone on tone colours. ...and when you look closer, particularly at the corner of the four diamonds. Its a treadling error! (this one is for you Linda....) . Its the shorter sixty inch runner and the longer one is just fine. That one will be going up in my Etsy shop. The other? I'm not sure what to do with it now. Keep it for myself or sell as a second? If anyone is interested in buying it, let me know. Sold! It really bums me out as I was watching carefully as I wove but apparently not quite enough... So what's the best cure for this situation? Another project.... basically move on to something new and start fresh! Calli says "cheer up Mum"